The 9 Best Doughnut Shops in Mississippi! Doughnuts are the perfect way to get the morning off to a great start. It's impossible to be in a bad mood when you're faced with your favorite doughnut (but you should get a dozen just to be sure). 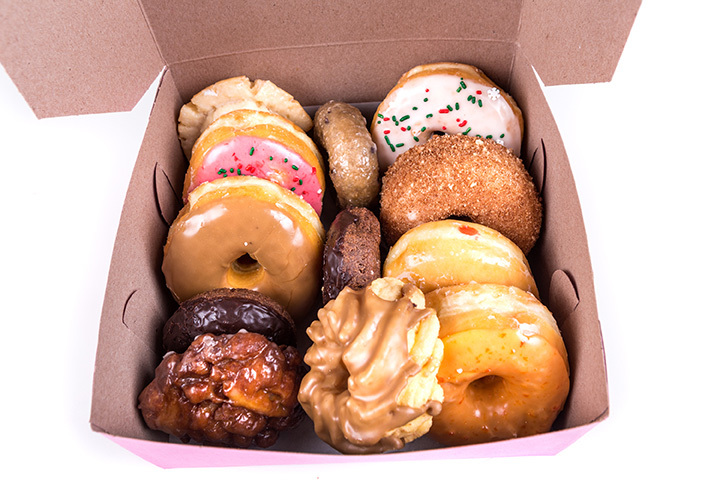 Whether that favorite is a cruller, bear claw, cake doughnut, or traditional glazed, you're sure to find what you're looking for at one of the 10 best doughnut shops in Mississippi. Tatonut has been serving up their potato flour doughnuts since 1960, and they are probably the most well-known doughnut shop in the state of Mississippi. The potato flour creates a lighter, fluffier doughnut with a unique texture that has won over locals and tourists for years. The family-owned shop is also active in the community, regularly publicizing and participating in charity events. For over 20 years, Monroe's Donuts and Bakery has been bringing their delicious pastries to the Jackson Metro. Mr. Monroe Jackson, along with his wife Cindy, still manages the company that he founded. The doughnuts are made fresh every day, and there are five convenient locations (three with a drive-through), so stop in for a treat today! Donut King in Southaven knows how to make a beautiful pastry. They use only the freshest ingredients, and their staff has an eye for perfect decoration. In addition to their doughnuts, fritters, and biscuits, they also sell cronuts, a croissant-doughnut that has taken the world by storm since it was invented in 2013. Steve and Cindy Scott opened the Donut Shop Cafe in 1988, and the business is still run by their daughter, Stephanie Scott Merkle. Today, the shop is bright and colorful, with its bright red roof and dining room full of local art making customers feel welcome as they enjoy their pastries and coffee. If there's one things folks in the Pine Belt appreciate, it's great service, and Local Roast & Bakery Cafe in Petal delivers in spades. Their doughnuts are handmade daily, and the friendly staff makes this the kind of place where you'll want to stop in for a chat and a treat every day on your way to work. Their king cakes are quickly gaining a reputation, too! The Donut Palace in Brookhaven is the kind of local place you just want to see do well. This family-owned business has a neighborhood feel that is hard to find these days. The owners go out of their way to make the customers feel like part of the family, and if you come in more than a couple of times, they'll probably remember your name. With a slogan like "You Deserve a Donut,” you already know you're going to like Lee's. Residents of Meridian can't get enough of Lee's sweet treats, but it's the excellent and speedy service that keeps them coming back again and again. Try the cake doughnuts and cream cheese croissants. The Donut Shop is a roadside stand in Natchez that is popular for its morning pastries and so much more. They come in every morning beginning at 1:00 a.m. to start making their doughnuts for the day. Their doughnuts are generous in size and, although you might not expect it based on the name, the Donut Shop is also popular for its burgers. Main Street Doughnuts has been gaining a positive reputation in Southaven ever since they opened, and this busy suburban city knows a thing or two about good food. One bite of a maple frosted doughnut and you'll see why Main Street's popularity is exploding! Of course, they also have a delicious selection of eclairs, cinnammon rolls, and other pastries to choose from.